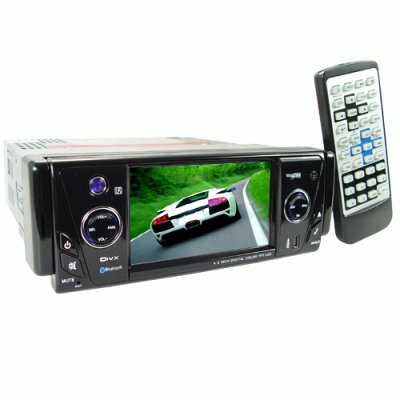 Successfully Added Car DVD Player With 4 Inch Touchscreen LCD + Bluetooth to your Shopping Cart. ISO Standard Size Single DIN (1-DIN) Region-Free Multifunction In-Dash Car DVD Player. Full color TFT display with Touch Screen. Bluetooth for handsfree phoning. Slide-down / removable front panel. RDS radio. CD Player also plays MP3 discs. Sub woofer output. Remote control included. Totally cool replacement for your car stereo... but remember to look at the road when you're driving. Available right now from the home of direct from China wholesale electronics, Chinavasion..